1. Line a baking sheet or cutting board with wax paper or parchment paper. 2. Chop up the chocolate roughly with a knife if it is in block form. In a medium-sized, microwave safe bowl, melt the chocolate in the microwave. Heat it in 45 or 60-second intervals, stirring between each time to ensure that the chocolate is melting evenly and not burning. Meanwhile, place blue sanding sugar into a small bowl and set it aside. 3. Berries can set at room temperature if you live somewhere cool, otherwise refrigerate them until ready to serve to allow the chocolate to set up. *Chef’s Tip: Store the berries in the refrigerator until you’re ready to eat them, as white chocolate is a little more heat-sensitive than other chocolates. The berries are best eaten within a day or two of being made. 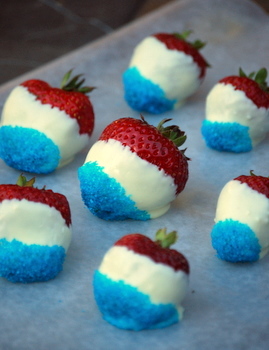 Posted on July 6, 2012, in Lady Fab Cooks and tagged 4th of July, appetizer, dessert, food, Memorial Day, party, recipe, strawberry, white chocolate. Bookmark the permalink. Leave a comment.